If you are a Filipino, you probably heard about what happened in the Philippines two days ago. Another storm struck the country again, bringing non-stop deadly rains in Metro Manila and neighboring provinces since Monday. It was raining for almost two days and they were saying that the amount of rain that fell is more than what Ondoy (another storm) brought in 2009. Classes, work and even trading has been suspended due to neck-deep waters on roadways. The water submerged cars and houses forcing thousands of people to flee their homes for safety. I have been glued on TV watching the live telecast of news from my hometown. The rescue operations were being fed via satellite, and you can see that they do not have the necessary equipments for these emergencies. You see people on the roofs shivering while waiting for somebody to get them. The hospitals were running out of gas for their emergency generators. The evacuation centers are all getting filled up with not enough bathrooms or shelters for those affected by the flood. They are saying that help is on its way but do they have enough resources to do so? All we can do is pray for everybody’s safety and that the rain will stop. The death toll rises every day and the damage left behind is not yet accounted for. A lot of infrastructures were damaged. Hope the Philippines can get back in due time and life be again normal to a lot of people. 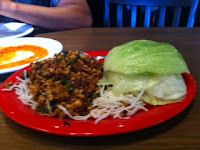 Another favorite at pei wei is the minced chicken lettuce wrap. This is made of small bits of chicken with shitake mushrooms, water chestnuts, scallions, garlic, rice sticks and lettuce. The way to eat it is to wrap the chicken in the lettuce, roll it and eat it like an egg roll. It is an appetizer but to me one serving is enough as dinner. I can finish one whole. We always order one for me and one for hubby. Before the school ended last June, they sent a list of supplies that are needed for back to school. There are what the kids would need for the new school year. The list specifically said what type of notebooks and folders the kids would need. There's nothing that is offered for free these days, even boxes of tissues, they are required to bring at least three boxes when the school opens. I always buy the school supplies first because they go on sale early. I am also very happy that I don't have to shop for clothes anymore. This is the second year that they are wearing uniforms. All I need to buy is a new pair of shoes, a bigger size than her old ones. I think her foot grew one size bigger over the summer. I do not panic buy when it comes with shoes since I found Famous Footwear that carries hundreds of name brand shoes and style at a great price. I like to shop at Famous Footwear because it is not crowded compared to other department stores. I am a busy mom so when I shop I just want to be in and out of the store if possible. For mom's who are also buying shoes for their kids, Famous Footwear has a back to school promotion of BOGO + 15% off Famous Footwear Coupon . This coupon will surely give you a lot of savings and if you are a Rewards member, you get 20% instead of 15%. It is easy and free to join the rewards program and right away you start earning 1 point for every $1 you spend in store or online to earn certificates up to $100 a year. So whoever is doing back to school shopping, do not forget to print the coupon by clicking the link. Do not worry if sometimes you cannot find your shoes in the store, Famous Footwear will get for you through home delivery or on www.famous.com. Bear in mind that this discount do not last. Print the coupon now and redeem at the store between 8/2-8/18. Enjoy your shopping.